Chicken becomes more tender the longer it cooks. Unfortunately, most cooking methods produce extremely dry meat when the chicken is cooked long enough to become tender. Boiling a chicken produces very moist, tender and flavorful meat that can easily be removed from the bone for eating alone or using in salads, pasta dishes and stuffing. Most whole chickens become fully tender in about one hour on medium-low heat. Larger chickens may require longer boiling times. Remove the plastic package of giblets from the abdominal cavity of the chicken. Place the chicken in a large pot with a lid. The chicken should fit so that there is some space on all sides and on the top of the chicken. Pour enough water into the pot to completely cover the chicken. Add the bay leaf, salt, garlic, pepper and any other herbs or seasonings you desire to the pot. Cover the pot and turn the burner to high. As soon as the water begins to boil, turn the heat down to medium-low and begin timing. Boil the chicken for one hour, then check to determine how tender it is. If it is not tender enough, return it to the pot and boil for an additional 20 to 30 minutes before checking again. 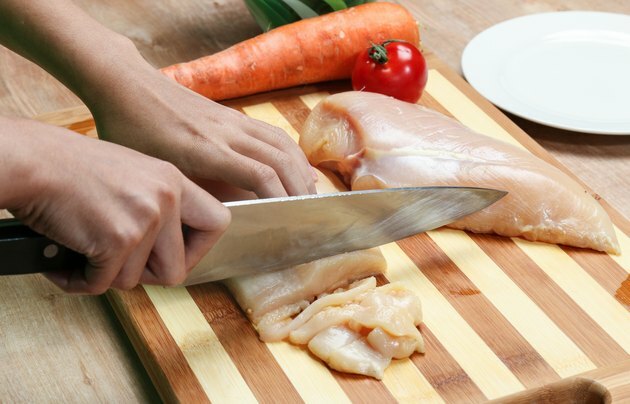 The meat should separate easily from the bone when the chicken is fully tenderized. Insert a meat thermometer into the innermost thigh portion and into the thickest part of the breast meat to check for doneness. According to the U.S. Department of Agriculture's Food Safety and Inspection Service, chicken is fully cooked when it reaches an internal temperature of at least 165 degrees F.
Add vegetables such as carrots, celery and onions to the pot about halfway through cooking time, if desired.